A bowl of porridge topped with fruit (fresh or canned in juice). 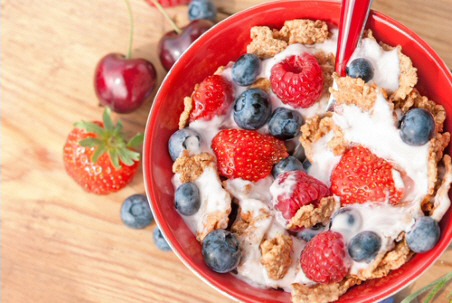 A bowl of cereal with milk, yoghurt, and fruit. Two slices of wholegrain toast spread with peanut butter, plus a milky drink such as a fruit smoothie, or coffee or Milo made with milk. Wholegrain toast and baked beans topped with grated cheese. Scrambled or poached eggs with grilled bacon. A filled wholemeal roll with lean beef, baby spinach leaves, tomato, and grated carrot. Pita bread filled with lean lamb or hummus, lettuce, tomato, and avocado. Jacket potato filled with chilli con carne or baked beans, topped with grated cheese, and served with a salad. Wholegrain toast topped with scrambled eggs, sliced tomato, and grated cheese. Omelette made with two eggs, cheese, ham, and tomato. Chickpea salad made with canned chickpeas, roasted pumpkin, feta cheese, tomato, parsley, and toasted pumpkin seeds. Follow your meal with a pottle of yoghurt or a milky drink. Meatballs in a tomato-based sauce, with pasta and a green salad. Beef casserole with baked potato, pumpkin, and broccoli. Chicken stir-fry with broccoli, red capsicum, and noodles, topped with sesame seeds. Seafood curry with rice, carrots, and silverbeet. Tofu and vegetable stir-fry with noodles, topped with roasted cashews. Lentil dhal, brown rice, and broccoli. Follow your meal with fruit (fresh or canned in juice) and yoghurt, or a milk pudding such as custard or rice pudding. A small handful of nuts or seeds. Wholegrain crackers with cheese and tomato, canned fish, or hummus and tomato. A peanut butter or cheese sandwich, and a piece of fruit. A milky drink such as a fruit smoothie, or coffee or Milo made with milk. Tip – make your own protein-enriched milk by adding four tablespoons of dried skim milk powder to two cups of milk. Use this milk as normal. Written by HealthInfo clinical advisers. Endorsed by Community Dietitian Nurse Maude Association. Page created June 2016.